So This week is a no-so-wordless Wednesday, as Zoe and I are going to put on a little fashion show for you all. I always say that I wish we could wear the same clothes. Now we have the same stylish dress, but she has the cooler boots. Don’t you think? Our mini-me clothing is inspired by looks from the latest magazines where actress and daughter are dressed alike. Well, thanks to Three Little Dots and Three Dots, we can have the same look as Katie Holmes & Suri, J. Lo & Emme, Jessica Alba & Honor. Three Little Dots & Three Dots apparel is designed to be more than just fashion collections – they’re a lifestyle. Both offer simple & classic All-American styles that never go out of fashion, as well as top-quality, durable fabrics that last forever. In fact, Three Little Dots is a brand that lets kids go out to play all day, and still look cute, fashionable and clean for dinner. As the “mini-me” trend takes over the catwalks and walk-in closets across the country, Zappos.com has successfully influenced the Three Dots brand, known for its perfect fit, top quality, and great design–and a favorite of Hollywood trendsetters and New York hipsters–to design a little girls fashion collection, Three Little Dots, sold exclusively on Zappos.com. Now I know that was QUITE Wordy for Wordless Wednesday but I couldn’t help but put on a mother daughter fashion show for you guys. vivabox is a unique experience for anyone. With vivabox, you purchase the box and it comes with a few themed items and then with a gift card for the recipient to finish it off by ordering things they want within that theme that you purchased for them. For example, give mom a wine tasting experience. She will receieve, a Gift card for a six bottle collection of wines, book: wine’s spectator’s essentials of wine and 12 issues of “Wine Spectator” Magazine. Then she can go on and pick the wine collection of her choice at vivabox. The variety is pretty good in my opinion. Through Mother’s Day use “mom2010” to receive 20% off a vivabox for their mom. Once that purchase is made, an email will be sent with a top secret discount code giving you access to 40% off another vivabox for their mother-in-law or another special woman in their life. Also, if you’re pulling together a round-up of Mother’s Day gifts for this holiday, I think vivabox could be a great addition. For more information, check out the vast array of new products at www.vivaboxusa.com. Verdi Spumante is a champagne options that makes any Mother’s Day fun and tasty, without the expense of a French champagne. You can use it to either tip back a glass or make a sweet dessert dish with your favorite mother. Verdi Spumante entices the taste buds and offers recipes on their website to increase your sensational experience. Puree ripe peaches in a blender and spoon into a large, chilled wine goblet. Sprinkle with lemon juice and sweeten with maraschino liqueur. Fill with ice cold Verdi. You can substitute peach juice or peach nectar for the peach puree. Cheesecake Factory, Abuelo’s, Red Robin, and IHOP. Speaking of IHOP, they launched their "I Mom" promotion which gives you the chance to receive a $100 IHOP gift card to take mom out on her big day. The contest coincides with the launch of IHOP’s craveable cheesecake Pancake Stackers, perfect for the cheesecake fan like me. There are many “natural” skincare products on the market, but few are rated by the Environmental Working Group with “0” toxicity. Skin Free Skincare has that honor. Created by a practicing pharmacist in response to patient’s needs, this line is safe, effective, and affordable. In addition to the Skin Free line, found at www.skinfree.net, they also offer their original Blue Ridge Gypsy Studio line. The Blue Ridge Gypsy products offer the same safe formulations with the addition of organic essential oils. They are found at www.blueridgegypsy.com. Shop Elliott Lucca’s Mother’s Day Sale at www.elliottlucca.com and receive 20% off the ENTIRE site with promo code: ELMD2010. Sale ends 5/6. See’s Candies are a local company and it is so hard to resist because you can get a free piece of chocolate on every visit. There is a huge variety of mouth-watering sweets that satisfy any craving. Give Mom the gift of indulgence with the new line of chocolates from the Keepsake Collection. Featuring both classic flavors as well as the new Strawberry Truffle, this line perfectly coincides with Mother’s Day with pink, yellow and orange designs brightening up the boxes. Godiva is of course one of my favorite chocolate brands. They are so rich and indulgent with truffles, candy bars, and deep dark chocolate. Now you can even purchase cake, cupcakes, and other baking goodies like brownies. Spoil mom with a chocolate tower of ultimate decadence. .
Zappos is a one stop shop for Mother’s Day gifts. Zappos has something for every mom, whether she is the fashionista, the mom on the go, the athletic mom, or the mom who does it all. Being a one-stop-shop, Zappos offers great gifts in apparel, pajamas, handbags, accessories, housewares, and spa and beauty products. With so many different styles and personalities, it can sometimes be challenging to find the perfect gift for Mom. Zappos makes it easy to browse through the site. Zappos even has a gift page with some great gift ideas! And if Mom is already an avid Zappos shopper, she knows there are always new products, brands and styles available at Zappos.com. Spreadshirt offers a variety of products from tees, tanks, hoodies, aprons, bathrobes and more. Check out all the great Mother’s Day suggestions on their “Gifts” page to help get your creative juices flowing—then design your own, thoughtful, one-of-a-kind gift. Sterling Silver Miracle of Life Necklace – The moment her children were conceived, she thought of each as a miracle. This beautifully detailed sterling silver necklace features an embracing mother and child figurine within a sparkling cut-out crystal heart. The pendant swings in front of a solid hart pendant, which can be engraved with a special message. Looking for camera, video, and facebook easy to access on your phone? Check out the MOTOBLUR for your social network mom on many Motorola phones. MOTOBLUR makes everything accessible on your home page on a number of Motorola phones. No need to go in and out of menus to Twitpic one thing or upload a video on facebook. Check out Motorola for other features like GPS, Bluetooth and remote wipe. Stylish moms will love Boost Mobile’s new Sanyo Juno by Kyocera handset. Available in an impulsive pink hue, the Sanyo Juno is a sleek and stylish phone that is the perfect accessory for mom’s busy schedule plus, its 1.3 megapixel camera with digital zoom, fun editing features and photo quality-capture settings make it a must for moms with paparazzi tendencies around their children. Frugal moms will love pairing this phone with Boost Mobile’s Monthly Unlimited plan which provides UNLIMITED talk, text messaging and Web, all for one flat rate of $50 per month, taxes included! Boost Mobile’s $50 Monthly Unlimited Plan can save moms and families up to $695/year in comparison to similar prepaid plans. In addition, with no contracts or credit checks, moms will have an easy, reliable and inexpensive way to keep tabs on family and loved ones. The Epson PictureMate Show’s seven-inch screen allows users to view photos in 12 entertaining slideshows formats and is conveniently operated with a remote control, keeping the screen fingerprint-free. Users also have the option of printing in a variety of effects (black and white, sepia and color), selecting different layouts (wallet-sized, mini-wallets, 4-per-page, 16-per-page, proof sheets, and borders) and printing 4”x6” photos on matte or glossy paper. With ink that is smudge, scratch, water and fade resistant, Mom can be sure that prints will last a lifetime! 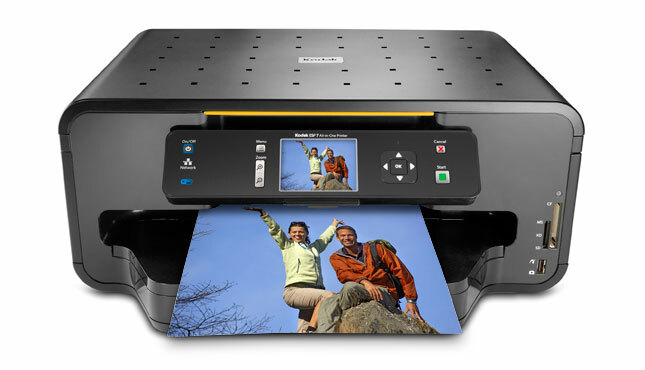 Meet an effortless way to wirelessly print, copy, and scan photos and documents for less. Kodak has combined the latest in printing technology with high-quality affordable pigmented inks to create the KODAK ESP 7 All-in-One Printer. Print fast and smart, and save up to 50% on everything you print compared to similar consumer inkjet printers.Plus, get the most out of your home network with Wi-Fi and Ethernet connectivity. It’s time for your printer to go wireless, for less. The sleek, powerful and affordable (starting at $749) MSI Wind Top all-in-one PC makes the perfect gift for today’s moms who need to easily and effortlessly balance home duties, work projects and family entertainment activities. Combining power, functionality, energy-efficiency, and ease-of-use, the Wind Top not only packs the power to run full HD movies for “family movie night,” but can help mom easily keep track of soccer practices, piano lessons and school events, and not to mention work presentations and reports. With a touch screen this is at the top of my list. The Wind Top’s integrated webcam enables mom to easily have “video chats” with family and friends who live elsewhere, while its creative photo software makes organizing family photos and creating custom photo collages a snap. No kitchen is complete for mom without the luxury of a KitchenAid Stand mixer. Designed for long life and quiet operation, the KitchenAid® stand mixer is the one mixer that generations have depended on for power, performance and durability. Built to handle large batches easily, this professional mixer features a rugged, all-metal construction, a powerful 475-watt motor, and KitchenAid’s unique planetary mixing action that reaches every part of the bowl. Wilton makes some really great kitchen accessories that all mother’s need to make cupcakes and treats for the PTA. For the mini star pan one cake mix makes 12-14 mini stars. 6 cavities pan is 14 1/2 x 11 in. ; individual cavities are 4 3/4 in. diameter x 1 1/4 in. deep. Aluminum. Let Trudeau provide mom’s midday boost with the new Lulu Travel tumbler. The leak-proof insulated tumbler is perfect for all moms looking for a midday jolt of coffee. Best of all, a portion of the proceeds from every Lulu is donated to The Breast Cancer Research Foundation. On sale now for $10.99. What mom wouldn’t love being treated to breakfast in bed on her special day? Trudeau’s Silicone Egg Poacher makes preparing perfect poached eggs a snap. The handle on the poacher allows for safe and convenient handling, and great breakfast. On sale now for $4.99. Serve mom delicious and refreshing Iced Coffee, made with the BODUM Ice in a Pavina Glass with silicone Grip from BODUM. With the unique foodpod™ from Fusionbrands, she’ll enjoy boiling, blanching or steaming foods like eggs, veggies, seafood and more. Perfect for deviled eggs! Mom will love how easy she can grab, pinch or pour spices, the necessary soupcon of corn starch, minced herbs, sauces or other ingredients without a mess when using the ever-so-cute Flex~it Pinch Bowl Set from iSi. *These companies did provide product for review free of charge to me. A few years ago, we used Zappos to buy some shoes. Actually it was my wonderful husband who purchased a pair of shoes for me. He purchased a pair of blue boots for me. I love boots. I have five pairs of boots. I have a pair of black boots, brown boots, two pairs of Rockport Boots, and the pair of boots my husband purchased from Zappos. I do have my eyes on some dance shoes. but we don’t use Zappos very often. One reason is that I’m trying to save some money and not purchase shoes for myself, I’m not very hard on my shoes so they last forever. I know women love to collect shoes, and I do too, I just prefer a certain type of shoe. The only time I might be able to justify getting myself another pair of shoes would be if I was getting another pair of dancing shoes. 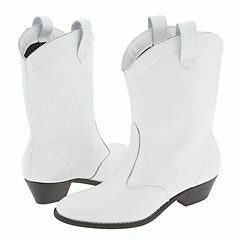 I have my eyes on these white boots because they are Dancing Shoes and boots at the same time. They are currently on sale but they aren’t quite cheap enough for me yet. I was looking for some coupon codes and found that Zappos does not provide coupon codes because they feel that their shoes are priced very competitively, with free shipping and 365 day return policy.